Buying a luxurious condo in Miami is only the first step in enjoying all that this city has to offer. Once the property is in your hands, you need to ensure that it suits your style and personality inside and out. While you may have limited options regarding exterior color and design, the sky’s the limit when it comes to your living areas inside the structure. One of the top choices for residences throughout Miami is marble, but you may be worried about the cost. While you love the look of marble, you don’t want it to cut into your entertainment or decorating budget too much. Before you decide that marble isn’t the right choice because of the initial cost, consider the many ways that marble is actually very cost-effective as a building material. Walk into a high-end department store and you just may see marble on the floor. It’s one of the top choices for areas that see a great deal of foot traffic because it’s so durable. This material has been used throughout the centuries in both interior and exterior applications. It’s proven that it can withstand the tests of time, regular use, and even high heels. While you may pay a little more for it initially, you can expect it to last for many years. Rather than going with linoleum that wears down and must be replaced, you can choose luxurious marble that just might last as long as your home itself. When viewing the price of marble, remember that you won’t have to worry about a high replacement cost, and that makes it a top choice for anyone who’s planning on keeping their Miami condo for a while. Homebuyers these days are savvy, and they know when they’re looking at premium materials that will be more durable than budget-friendly options. Not only do they recognize marble when they see it, but they also appreciate the value in this natural stone. It makes a home that’s for sale more attractive, and it can even lead to higher selling prices. If you plan on staying in the home through retirement, then you’ll be pleased to know that marble floors can still boost the value should you decide to refinance or take out another mortgage. The better return on investment is another way that marble proves to be more affordable than most other building materials. Carpeting needs to be vacuumed and steam cleaned often. Wood takes regular polishing and sealing. Linoleum can be impossible to clean, but marble is wonderfully easy to care for. A broom and damp mop will take care of most marks, mud and sand. You can seal it annually to help prevent staining, but this process is easily handled by the homeowner. Over the years, you can expect to save a substantial sum on your maintenance requirements when you upgrade to marble. If you love the look of marble but are still worried about the initial price, then consider mixing it with other materials. Use the marble as a beautiful center field and then place a more affordable travertine or limestone around the border. This is an easy way to add visual appeal to the room while also keeping the cost down. You’ll still get all the benefits of luxurious marble, but you’ll save some money in the process. 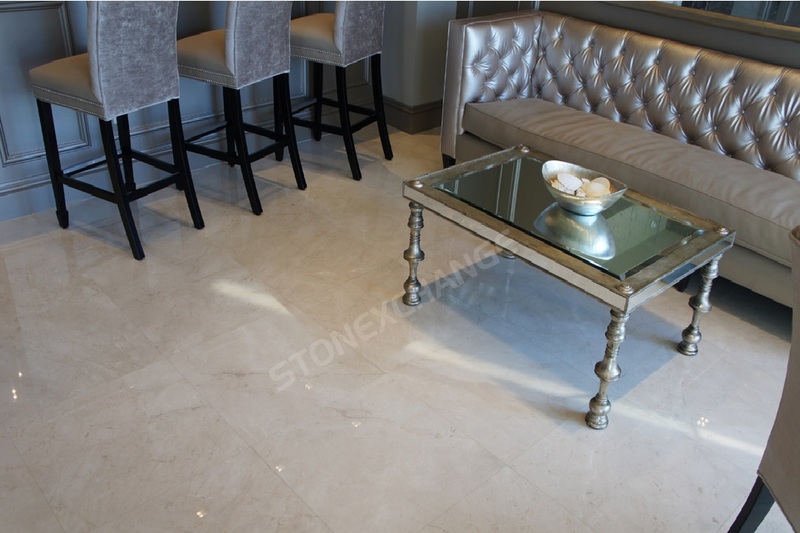 Installation of a marble floor can be expensive, and this provides you with another opportunity to save. If you’re reasonably handy with tools, then you can take a class at your local home improvement store to install the floor yourself. Invest in the appropriate backboards to remove any flex from your subfloor and help avoid problems with cracking later. If you’re not comfortable doing the work yourself, you can still save on demolition costs by removing the old flooring yourself. Some contractors may also provide you with discounts on installation if you order the materials yourself or decide to pay with cash or check. The easiest way to save on your initial price is by taking advantage of wholesale pricing. Work with a company that eliminates the middlemen and is in charge of their supply chain from the initial quarrying of stones to the final delivery. When these savings are passed on to you, it can be possible to save a substantial sum on all of your marble tiles for your floors, walls, showers, and even outdoor kitchen area. When it’s time to choose your supplier, look for one that’s committed to great customer service. You need to work with a company that packages the merchandise carefully to minimize damage and ensure that the products will be ready to use. Otherwise, you’ll lose time sorting through damaged pieces to find good tiles, and you’ll lose money shipping the damaged pieces back to be replaced. When the merchandise is packaged with care, you can be confident that this hassle can be avoided. Another benefit of working with an experienced company is that the representatives will pay attention to detail with your order. When you get the right products the first time, you’ll save time, frustration, and money on the final installation. Making the decision to go with marble floors is easy, but you also need to find a company that can meet your needs and provide you with great service. There are little steps you can take onsite to keep your costs down, and there’s no doubt that marble is more cost-effective in the long run. However, the best way to save on the initial purchase price is to find a wholesaler that’s willing to work with the general public. Nalboor is here to serve you, and we’re ready to supply you with all of your marble floor tiles. We take pride in our high-quality stones, and our bulk pricing options are sure to help you save money. Contact us today to discuss your upcoming project, review our inventory and place your order for custom floor tiles.